A combination of high energy and experience as a successful entrepreneur and economic commentator is what enables Pearce Flannery to deliver captivating keynotes, which are guaranteed to challenge audiences, and help them pursue their goals and dreams. In addition, Pearce is a prominent motivational speaker whose talks are sure to be remembered. 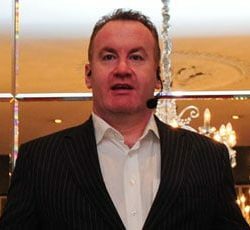 Pearce Flannery is an award winning entrepreneur and best selling author. He is renowned as one of the world’s leading training facilitators and motivational speakers. Furthermore, he is the founder of the acclaimed Pragmatica™ organisation. This is an organisation whose seminars are celebrated worldwide for delivering extraordinary performance through their unique range of corporate training solutions. Pearce has coached and mentored thousands of people, and is able to name many leading international sporting, political and business personalities among his clients. As an economic commentator, Pearce enjoys the subsequent acclamation of being the first to highlight the problems with the Irish economy and their causes in print and in the general media. At the time, his stance on this matter was not a popular one. Pearce’s programmes and development seminars are delivered in his inspirational, high impact and motivational style, and they are guaranteed to challenge participants to strive for the changes required in pursuing their goals.